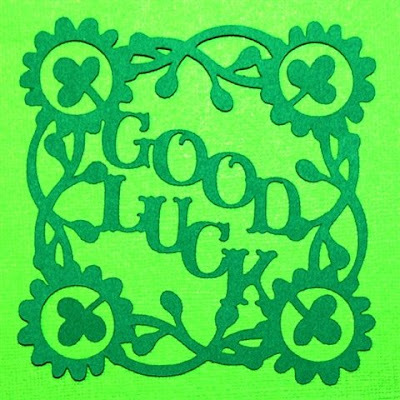 Capadia Designs: With a Little Bit of Luck! Today I finished up several of my swaps and got them off to the post office. I can't wait to be able to share them once they have been received by the other members of my groups. With a "little bit of luck," I'll finish the rest tomorrow and everything will be in the mail! I have been receiving a lot of questions in the past few days and I thought I'd answer a few of them here in case any other readers have the same problems or questions. 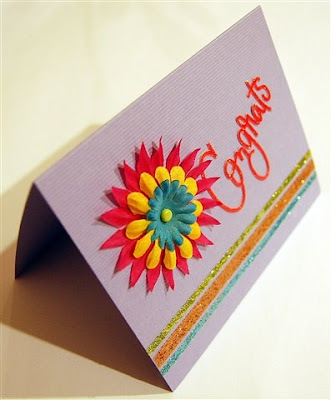 One question was about the tape I used to do the glitter on the cards (here is a LINK to that post). It is called "Scor-tape" and you can order it from the Scor-Pal company - here is a LINK to their store website and here is a LINK to the Scor-Pal website. It is similar to the "red liner" tape you can find in some large craft stores but much more economical - Scor-tape is sold on 27 yard rolls and, as an example, the 1/4 inch size costs $4.80 (red liner tape typically comes on 5 or 6 yard rolls for about the same price). I highly recommend it both for glitter and for keeping boxes together firmly. Another question was about my ATG (adhesive transfer gun). I recently purchased this from The Tape Depot for $25 -here is LINK to the website page for the ATG50. 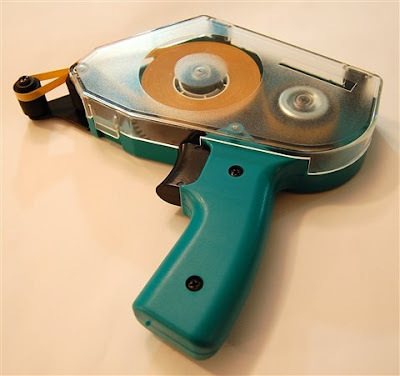 I find the gun easy to use and, once again, it is more economical to use a system like this - particularly for cards and projects that require lots of adhesive. The gun does not come with tape so you will need to order the rolls of tape separately - if your order totals $50 or more you will get free shipping. I still use my Creative Memories tape runner for scrapbooking. 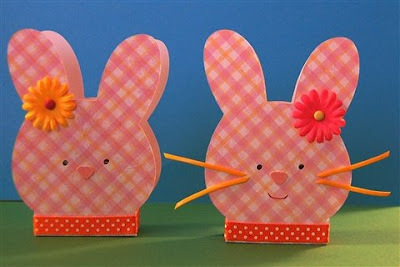 A few people have commented that they have had a problem cutting the bunny candy holder - (LINK to the post) when they go to add the detail cuts on the second page, the entire bunny head is cut. This one has me baffled. I have checked my file and downloaded it from the file sharing site and it is correct and cuts properly. 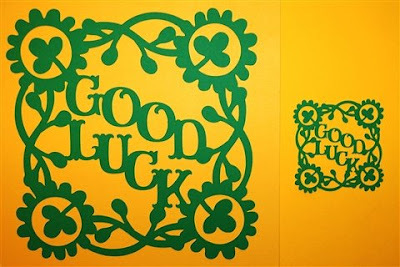 With St. Patrick's Day just around the corner, I wanted to share this adjustable "Good Luck" design again. I created it shortly after the August '08 update to the software, when I first discovered how to make adjustable designs. Here is a LINK to the original post and I have another variation that I will try to post tomorrow - I just haven't had a chance to test cut it yet. This file uses just the Storybook cartridge and can be cut on any of the machines since it is an adjustable design. I also cleaned up the file for the butterfly aperture card from a couple of days ago so I could share that with you today. 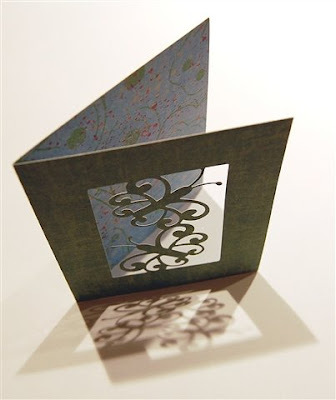 The file will cut two A2 cards on a 12 x 12 mat or one A2 card on a 6 x 12 mat (for baby bug and Create owners). The cartridges used are Beyond Birthdays and Graphically Speaking. I have a few more swaps to finish tomorrow and then I will be all caught up! Oh SOOOOO Pretty!! I love this design! But rats! Now I have to buy two new carts that I don't already have. HAHAHAAA!! I also entered it in today's challenge at SCS and credited you. Thanks again! Thank you for sharing. So awesome!